Turku, the former capital of Finland, has its own scene of marginal / alternative rock scene, or prog scene, if you like, with bands such as Kosmos, Viima and the newcomer Sisare. When it comes to the Finnish Psychedelic / Space Rock, Helsinki and Pori are the leading towns, but cleverly named DASPUTNIK comes from Turku. The quintet plays guitars, saxophones, keyboards, bass and drums. 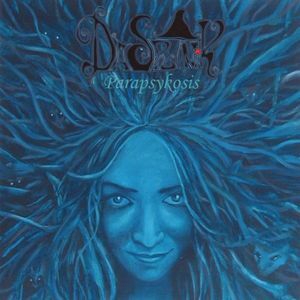 Parapsykosis is the first one of the two albums this far. 'Hzz' (10:31) is HAWKWIND-reminding, riff-based space rock that speeds forward like asteam train. Before the halfway there's a bit slower section with sinister distorted mumble, and later comes further occasional changes in the scenery (ie. tempo and atmosphere), at times rather jazzy. The second track is as hectic. Guitars operate mostly in the low ground with the attacking rhythm section, while flowing, impravisational melodies are primarily played by (soprano) sax. Synths hover in between, often with a Theremin-like sound. 'Tigerbalm', which starts with an acoustic guitar, is in slightly calmer tempo but the tension is there nevertheless. I like this atmospheric track where all instruments are equally audible, but the reappearance of the distorted mumble is only a nuisance for my ears. The next two tracks are the shortest - approximately three minutes each - and they don't bring any new ingredients to the soup. On the home sofa this music perhaps gets too monotonic, but I'm sure seeing this energetic band live would be a deeply impressive experience. 'Space of India' (11:22) is aptly named as it has some Oriental nuances. Occasionally it sounds as if there was a sitar and other Indian instruments, but at least they are not listed. All in all, Dasputnik are pretty good at what they do, which may be a bit narrow-minded on the long run. Cover art by Laura Andersson is cool! And by the way female is also the band member who would be my choice of their trade mark factor: Sini the saxophonist.